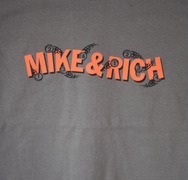 Mike & Rich - Mike & Rich T Shirt. Planet Mu. Mike and Rich 'Expert Knob Twiddlers' logo design T shirt. Printed on a Gildan Heavy Cotton T shirt in Grey. A classic fit, preshrunk, short sleeved tee shirt thats made from 100% cotton. Textile weight 185 g/m2 (175 g/m2 in White).